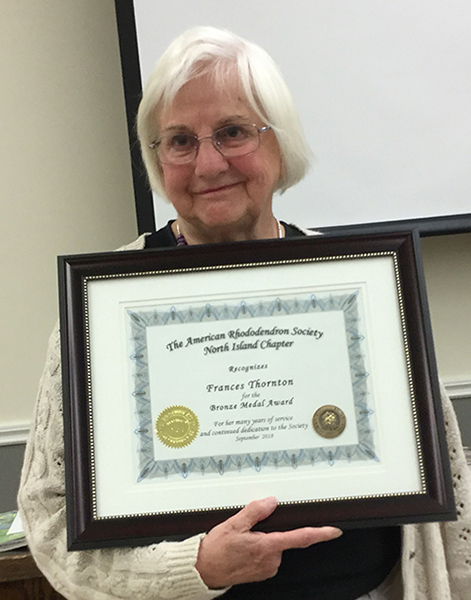 It was with great pleasure that President Maureen Denny presented the American Rhododendron Society Bronze Medal to Frances Thornton on September 11, 2018. The ARS Bronze Medal is awarded for outstanding contributions to a Chapter and is the highest commendation awarded by a local Chapter in the Society. Fran joined the North Island Rhododendron Society in 2004 and has been an active member and volunteer throughout this time. Fran is a regular at our monthly meetings and participates in the majority of our social functions and tours. Cheerful, warm and welcoming, Fran has always been available to act as a ‘gate sitter’ at our Annual Mother’s Day Garden Tour and to volunteer at our Rhodo Sale and Truss Display each spring. Fran has been an integral part of the core of volunteers working at, and for many years helping to coordinate, the NIRS table at the Sale. Elected as a Director in 2014, Fran served a four-year term heading the Revenue Table at our monthly meetings. With her subtle sense of humour, Fran highlighted the items for sale and was always very successful at ‘moving the merchandise’! Fran’s broad knowledge of plants, and her love of rhododendrons has enabled her to be a great support to the club. We thank Fran for her contributions and congratulate her on being awarded the ARS Bronze Medal by the North Island Rhododendron Society.